One carry-on bag, zero checked baggage. The concept seems absolutely Zen-like in its simplicity. Given that American Airlines and other carriers now charge for every checked bag, the strategy can help cut your travel costs, too. 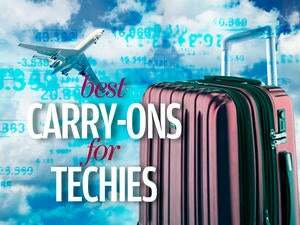 But for mobile professionals toting a laptop and other gear, how practical is the one-bag-only approach? For a recent trip from San Francisco to Charlotte, North Carolina, I decided to find out. Whenever possible, I follow a two-carry-on, zero-checked bag strategy. I pack a backpack or smallish bag containing a laptop and other materials I'll want at my seat. I stow this bag under the seat in front of me. I also pack a larger wheeled bag containing clothing, toiletries, and other items I don't need during the flight. This goes into the overhead compartment. When I'm in the airport, I loop the smaller bag's back over the wheeled bag's telescoping handle, so I don't have to carry the bag. On long trips, I usually check one bag and carry on one or two. On my recent San Francisco-Charlotte trip, I challenged myself to follow the strategy advocated by Doug Dyment on his site OneBag.com. Dyment suggests it's best to travel with only one bag--with no wheels. Bags without wheels can accommodate more items and aren't as heavy, the theory goes. If you must have wheels, the site recommends using the Travelite luggage cart, $30 at Magellan's. I started off by packing everything--clothes, toiletries, a pair of shoes, reading material, MacBook Air laptop and accessories, Palm Treo, and other gear--into a Red Oxx Air Boss ($225). (Dyment helped design the Air Boss.) You carry the Air Boss over your shoulders with a strap. By the time I finished, the bag weighed over 25 pounds--even though I'd streamlined my clothes as much as possible. I faced a long layover in Dallas/Fort Worth on the trip out, and I had only 50 minutes in Chicago O'Hare to make a connecting flight during my return trip. The thought of hauling 25 pounds while I moseyed about the Dallas airport or dashed frantically through O'Hare was hugely unappealing, so I opted to schlep my bag on a Travelite cart. My virtuous intentions aside, I confess that just before leaving home, my instincts told me to pack a second carry-on bag. Into a small backpack went the MacBook Air and its accessories, newspapers, nutrition bars, and a lightweight jacket. I'm grateful that I followed my instincts. Coming home, the Charlotte-Chicago leg of my trip was on an Embraer regional jet with small overhead compartments. I had to check my Air Boss at the departure gate. If I hadn't packed the backpack, I would have had to scramble to extract my laptop and anything else I might want on board. Traveling with the luggage cart posed its own challenges. For instance, TSA security personnel wouldn't allow me to place the Travelite cart with the Air Boss bag attached on the security X-ray machine's conveyer belt. To detach the bag from the cart, I had to unhook the cart's straps holding the Air Boss in place; push down the cart's handle; fold the cart; wrap the straps around the cart; place the cart in a plastic bucket; and feed the bucket to the security checkpoint scanner. This added several steps to the security checkpoint gauntlet--which already includes enough steps as it is. Another dislike: Whenever I made a quick turn while dashing through an airport terminal, the Travelite cart and Air Boss bag would wobble. A wheeled bag, in my experience, is more stable. Why Limit Yourself to One Bag? The one-carry-on, zero-checked-baggage strategy may work for travelers who are extremely well organized, never fly on regional jets, and don't travel with a lot of gear. The Air Boss is a great bag if you want to go that route, though I can't recommend using it with the Travelite cart for airline travel. This strategy isn't for me, however. As long as I'm traveling on airlines that allow two carry-on bags, that's what I will take on board. One will be a wheeled bag for the overhead bin. The other will be a smaller bag for my laptop and other items I'll want at my seat. I've noticed many mobile professionals in airport terminals using this strategy, too. It's not a perfect solution--a wheeled bag is less flexible than one without wheels, which can make it more difficult to cram into an overhead bin. But overall, it's an easier, less stressful approach than the one-bag-only method. "Packing Tips for Painless Trips"
"How Not to Pack a Laptop"
Best Notebook Upgrades: When configuring a new laptop or upgrading an old one, it's easy to go overboard. But there can be drawbacks to the upgrades if you're not careful. Example: Adding more memory can boost your laptop's performance. Your system may not need but so much extra memory, however, and the extra RAM can help drain your laptop battery faster. Read "Upgrade Your Notebook Without Going Over the Line" for more tips. Top 10 Ultraportables: Our Top 10 charts have been redesigned for easy reading and comparisons, and our Top 10 Ultraportables was recently updated. The number-one ultraportable is the Lenovo ThinkPad X61, and three other Lenovo models also made the chart. iPhone 3G: To Buy or Not to Buy? Has the recent news that the iPhone 3G's data plan will cost $10 more than the first-generation iPhone given you second thoughts about buying the phone? If so, take a minute to read "Will Higher Data Plan Costs Hurt IPhone 3G Sales?" with two opposing opinions on whether the iPhone 3G is worth the extra monthly fee. Also worth reading is Melissa Perenson's report on the first 48 hours with her new iPhone--which, in her experience, wasn't delivering 3G speeds.